Welcome to the largest selection of Single-Stage High-Capacity Dry Screw Pumps in the vacuum industry. SynSysCo provides eight (8) distinct models with pumping speeds from 150 M3/Hr. to 3,000 M3/Hr. Let us help you bring the advantages of dry vacuum pumping to your industrial process. Eliminate the costs and hazards of frequent oil changes, workplace oil misting and hazardous waste disposal. 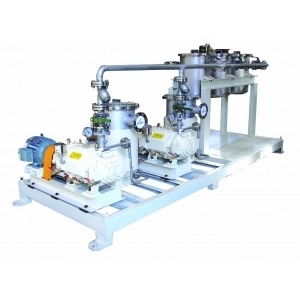 Choose from our wide range of models to support your specific vacuum process needs. Our SDS line can be complemented with our magnetic levitating turbo pumps, cryogenic pumps, and vacuum instrumentation and components to meet your dry vacuum pumping requirements. We can also add second and third-stage blowers to increase pumping speeds to 10,000 M3/Hr. or higher. Since their introduction in 2000, SDS series packages have provided consistent performance to a variety of users. We will be glad to consult with you and configure a standard or custom package to meet your processing needs.